In a container place all of the ingredients for the marinade and add chicken strips. 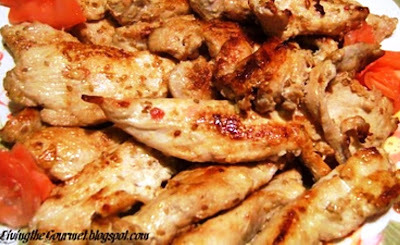 Toss the chicken so all of the pieces are covered with the marinade. Cover and place in the refrigerator for at least 1 hour to overnight. Place the chicken on a heated griddle, turning once. Let the chicken become a beautiful healthy, golden color. This should take about 3-4 minutes per side, depending on how thick you sliced the chicken.